We had just a brief stay here but from the start the service was amazing. They catered for my wife's food intolerances without hesitation and to perfection each and every time. the food is exemplary and without match as far as a resort is concerned. The facilities and especially the rooms are top shelf. Everyone needs to do the hike to the top of Mololo Island where an old WWII gun battery is located. the views are incredible. Whilst the price point is more than most resorts, the value for money is incredible as everything is perfect. Everything about Likuliku Lagoon Resort is first class. From the moment you arrive to a warm musical welcome to when you leave to beautiful music the staff always make you feel special. The restaurant is 5 star all the way from the freshest ingredients used in creating delicious dishes to the attentive, friendly wonderful staff. The rooms were amazing and the overwater bures are awesome. The staff right across the resort are friendly, attentive and nothing is ever too much trouble. The resort location was beautiful. The food was exquisite and a culinary delight at each meal. The Fijian staff made all of this so much more enjoyable. Their warm, welcoming and friendly manner generated an environment of peace and calmness that permeated into the soul. Thank you to all the staff at LikuLiku Lagoon Resort and we wish you all the best for you and your families. This is a place to go if you want to be treated like royalty. The staff are wonderful ,friendly and do everything they can accommodate your wishes.The property itself is beautiful from anywhere you are standing ,walking or sitting.We stayed in the deluxe beachfront bure and it was magnificent. The decor, the bed, the view from the bed, the plunge pool on the deck, the outdoor shower was just perfect. The beach was a few metres from our bure. It was like we had our own private bay. Our days were spent morning swim and walk on the beach, get wet in plunge pool enjoy a cool outdoor shower, have a beautiful buffet breakfast then bake it on the beach or by the lovely pool have exquisite lunch then another swim then shower and have drinks at the beach bar and have a lovely three course meal with a bottle of wine then relax again and maybe get a dvd to watch and do it all again the next day. So if you want peace, beautiful accommodation, excellent food, breathtaking scenery and privacy and be treated like a queen Likuliku is the place for you. This five star resort met and exceeded our expectations...the stay there was truly a resort holiday with excellent accommodation, fabulous food and wonderful service from all of the Resort staff. 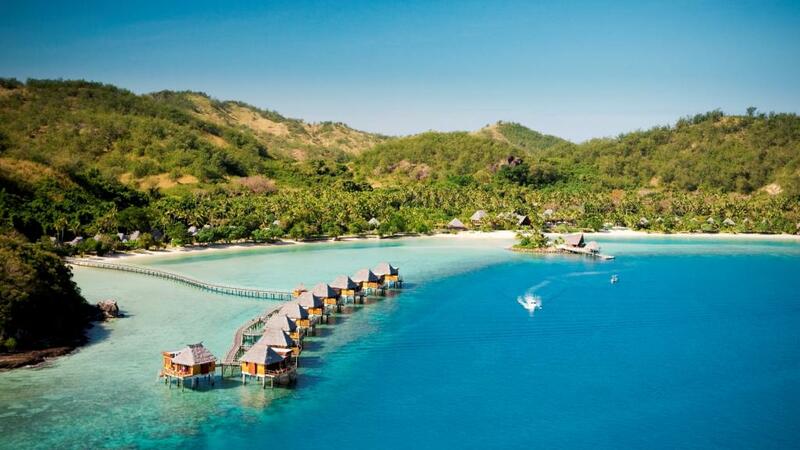 The Likuliku Lagoon Resort is a little piece of Fijian paradise. They have a very good service in Likuliku, and all staffs are very nice to their customers. They offer foods three times a day, very delicious. Amazingly beautiful, impeccably cared for by truly wonderful staff. Great food. Cannot fault our time at Likuliku. Likuliku Lagoon Resort has got to be one of the most relaxing and enjoyable holidays I have had so far. The service was amazing, the food was absolutely divine, the location is perfect (snorkelling was amazing right off the main jetty)... there is nothing bad i can say about this place, we loved every moment that we were there and it is definitely somewhere I would return to for another week of serenity, romance and relaxation. Highly recommended and worth the money for the deal that I got for the 5 nights. We didnt want to leave. This is the 2nd time we have been to Likuliku and definitely will go again. Could not fault anything, location is incredible, resort and facilities fantastic and the staff where awesome. Tailor made food, overwater bures, friendly staff, perfect location what else can one as for! We enjoyed an over-water bure for a 7 day holiday. Absolutely wonderful. Dropping off our own sea-side steps onto the coral reef, warm water, abundant fish life, glass viewing panels in the floor of our bure, wonderful friendly staff, top class dining experience for every meal, room service canapes every afternoon.... A holiday we will be repeating. The resort exceeded our expectations in every way. Accommodation, dining, friendliness and professionalism of the staff and the activities were outstanding. The Lagoon and surrounding scenery takes your breath away, it is so beautiful. We plan to return in 2015. Taking Relaxation To A New Level! As part of our 40th wedding anniversary, my husband booked us into paradise! The moment we arrived, we were welcomed 'home' by the most friendly, professional and caring of hosts - the entire staff of Likuliku. Each one of them contributed to our most delightful, relaxing, entertaining and comfortable retreat. The amenities were top notch, the food was sensational fine dining style and the location was idyllic. All in all, we spent six days in paradise ... and we can't wait to return 'home' to the best Fiji has to offer. We just loved our relaxing stay at Likuliku Resort, and are already talking about a return trip. For our family of husband, wife and 2 adult daughters it was absolutely perfect. Staff were the BEST ever, food exceptional. Totally recommended! Every aspect of this location was impeccable. Every detail was thought of. The staff were superb and made every effort to personalize our stay. The facilities were faultless and the location is out of this world. There are no words that could really do this place justice. A beautiful honeymoon destination, with fabulous service, friendly staff and a relaxing vibe. Everybody should travel here once in their lives just to experience the fijian people. rooms are beautiful, spectacular views, stunning cuisine, the perfect getaway for anyone wanting to relax like never before! Absolutely amazing!! I had been looking around for a while for a destination for my honeymoon for a while and came across this property and I am so glad I did! I arrived into Nadi and was transferred over to the Island by Seaplane which I would highly recommend (if you have the extra money). On my arrival to the island I was greeted by the friendly staff with a Lai and refreshing drink. My partner and I stayed in an overwater bure and it was absolutely breathtaking. I enjoyed every minute of my time and am thankful to all who made my honeymoon more than outstanding.